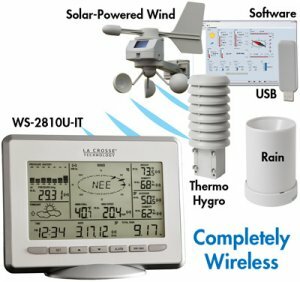 A true professional weather center WS-2810 assesses a host of climate conditions using all included thermo-hygro sensor, self-emptying rain gauge, and a solar-powered wind sensor. The weather center holds 1750 weather data sets recorded at user-selected intervals. A large contrast adjustable LCD screen of its console displays date and 12- or 24-hour time, forecast icon with tendency indicator, indoor/outdoor temperatures (Fahrenheit or Celsius), indoor/outdoor relative humidity percentage, wind chill, speed, and direction, air pressure, rainfall rate and totals, dew point, etc. The weather center’s remote sensors can send data wirelessly from a distance up to 200 feet to console. For data storage on a home computer, the weather center comes with a USB transceiver and the free download of La Crosse’s Heavy Weather 2800 Pro PC software v.1.3 (compatible with Windows XP, Vista, and Windows 7 operating systems). The transceiver communicates with the receiver from up to 80 feet away.LAC0003 WEATHER STATION SOLAR RAIN, WIN. Receiver: 4.59" x 0.94" x 7.01"
Thermo-hygro:3.13" x 3.54" x 7.45"
Rain Sensor: 5.18" dia. x 7.19"
Wind Sensor:9.84" x 5.74" x 11.11"